You did it; you booked your family’s summer vacation to a tropical island. 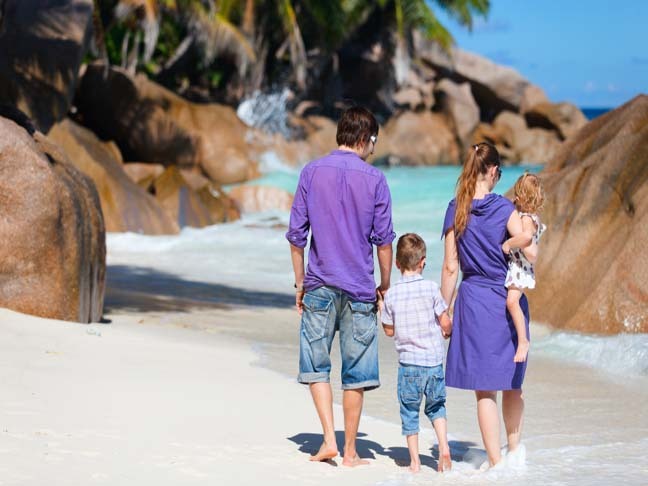 Sun, sand and surf will offer a multitude of activities to keep the kids busy while you soak up some much need vitamin D.
Now comes the hard part packing, and not just for you but for the whole family. Gone are the days when you could just throw a bathing suit, sunglasses and coverup in a bag and jump on the plane that very same day. Now you have to plan. But with my six essential items to pack your trip will be an island breeze. Yes this would seem obvious as you are going on a tropical vacation but I have found the most obvious items are the ones I always forget. I tell myself of course I’ll remember the bathing suits and then I get wrapped up in preparations and inevitably forget the suits. While it’s not the end of the world, clearly you can buy new ones, why create the headache? I always pack sunscreen in my suitcase. I bring one nice one for our face and one average sport type for our bodies. We purchase more on the trip but inevitably we get in early enough for the kids to want to go right to the pool and it is so much easier if I can slather some sunscreen on them right away and let them head out to swim. I make sure everyone has a light sweater or sweatshirt both for the plane as well as cool evening nights. Especially after a day in the sun when your skin has reached a little pink hue a light cover up is greatly appreciated. You never know these days if your flight is going to be delayed or maybe have to circle the airport so I like to cut the “kid meltdown” off at the pass and have something to occupy them. A book, magazines, even a downloaded video to the ipod, I’m not above using videos to head off the meltdown, all are great in a clutch situations. Yes embrace your touristness and be one of those families that snaps away, trust me, you’ll thank me for it later. Memories are great but a picture is worth a thousand words, and really can you adequately describe the look on your suns face when the parrot sat on his head? As we all know traveling with kids does not always go as smoothly as we would like, but keep in mind this is a vacation it is supposed to be fun. So relax, go with the flow, roll with the punches and most importantly–smile. What are your essential items to pack?